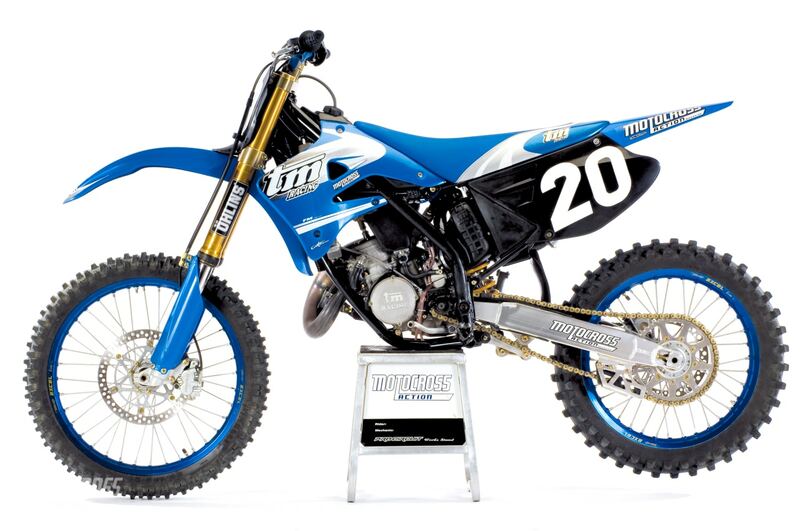 This is an archived 2006 TM125MX MXA test from the November 2005 issue of Motocross Action Magazine. Get your MXA subscription today. TM, the Italian bike manufacturer, has been around for many years, and their claim to fame (as far as a marketing strategy goes) is that they are the only manufacturer offering a full-blown factory bike to the public. Americans have never seen a Team TM works bike, so we’ll have to take them at their word. There are no TMs racing the AMA Nationals because they have never homologated their bikes (which entails the rigorous regimen of writing a check to the AMA). Well, that isn’t true. Several years ago, TM showed up at an AMA National and signed up several riders. No tricks. No subterfuge. They filled out the entry blanks and the AMA accepted their entries. It wasn’t until after the race that that the AMA realized that they had allowed illegal bikes to race a National. How did it happen? The AMA thought the TM riders were on KTMs, but that they had spelled it wrong. Lacking a works TM to compare to our test bike, we assume it is a works bike. We do know that our 2006 TM 125MX is the only one in the United States. How do we know? The importer showed us his custom’s logs. 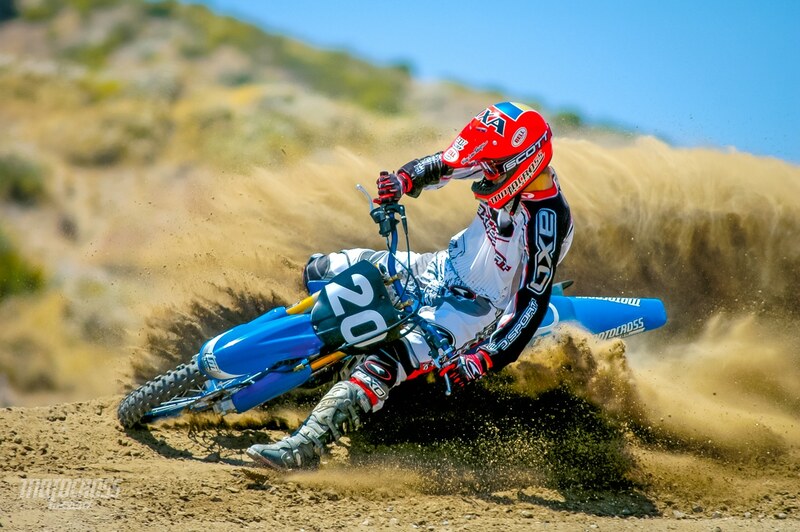 Q: IS THE 2006 TM 125MX FAST? A: You bet. This Italian two-stroke engine breathes fire. However, since the engine is based on technology that has proven itself in the World Karting Championships, keeping it on the pipe is the hardest part. This is a mid-and-up engine in the purest sense of the phrase. It doesn’t have any bottom and very little over-rev. It’s a gun and run powerband. Every MXA test rider had a simple strategy: Wind the engine out until just before the dogs howl, then slam in another gear. Once you get the drill down, you are rewarded with plentiful power. For comparison purposes, this is the best TM 125MX engine we have ever ridden (shockingly, we have ridden more than a few 125 TM’s in the past). The engine has been improved over previous models and it is easier to ride. Q: WHERE DOES THE 2006 TM125 ENGINE SHINE? 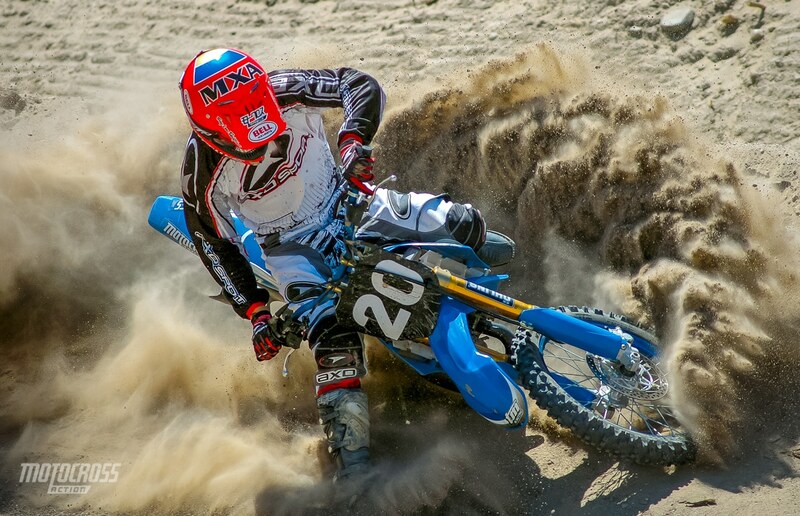 A: Our best results on the TM 125MX came on tracks with intermediate dirt or hard-packed loam. In anything extremely soft, it was difficult to keep the rpm up. This is a slam, bam, thank you ma’am powerband. It is very reminiscent of the old-school, 125 two-strokes of the early ‘90s, where you stirred the gearbox with your foot while wicking on the throttle. If either limb, foot or arm, got out of sync, you would have to clutch it back up on the pipe. All this said, we were pleasantly surprised with the engine’s performance. It didn’t have the potency of the 2006 Yamaha YZ125 or the growl of the Kawasaki KX125, but it had a solid hit and exhilarating rush. Q: HOW WELL DOES IT SHIFT? A: In previous TM tests, we battled more with the gearbox than we did with the powerband. The 2006 TM125 gearbox is leaps and bounds better than in the past. On all our earlier TM tests we felt that it was best to play it safe and chop a little before snicking the next gear. The 2006 gearbox wasn’t as touchy. You could not only slam it from gear to gear, but it wouldn’t hang up if you over-revved the engine. Q: HOW GOOD WERE THE OHLINS FORKS? A: Too soft for serious racing. If we hit anything bigger than a candy wrapper, the forks would jar the rider. The front end needs stiffer fork springs and a higher oil height to handle anything beyond short-track racing. 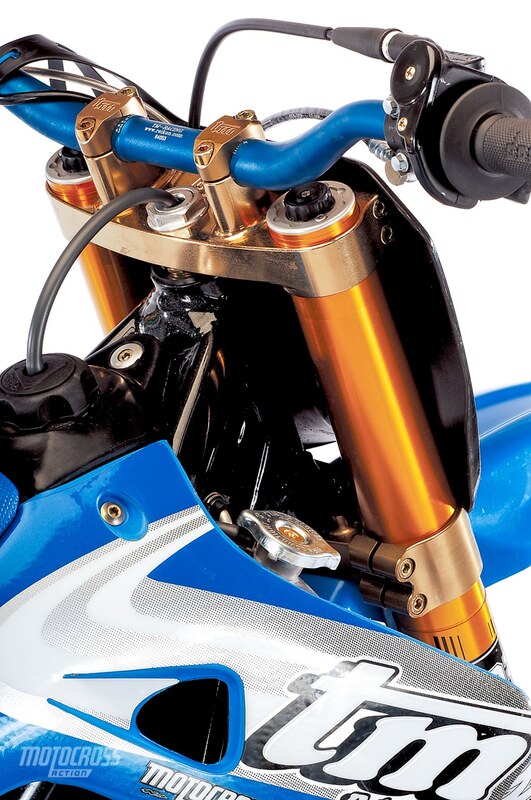 The TM’s 48mm Ohlins forks dove under braking, tended to hang down under acceleration and ka-boinged over jumps. We don’t think that the damping is the problem. The forks had a fairly fluid stroke on the bumps that the spring could handle and it seemed to have a fairly good range of adjustment. Unfortunately, turning compression clickers can’t make the overall feel firmer–they only effect the last three or four inches of travel. Q: HOW ABOUT THE OHLINS SHOCK? A: Have you ever read Dr. Jekyll and Mr. Hyde? Dr. Jekyll was the good doctor and Mr. Hyde was his evil alter ego. That is how we felt about the TM 125MX’s suspension. The Ohlins shock is Dr. Jekyll, while the Ohlins forks are Mr. Hyde. It’s a shame that the shock and forks couldn’t work in unison to create a wonderfully suspended bike, but the Ohlins shock is true beauty in every sense of the word. It does exactly what it’s supposed to do, and it looks high-tech (for those of you who drool at the sight of technological beauty). The Swedish shock receives an A+ in our book. Q: HOW DOES THE TM 125MX HANDLE? A: In all honesty, once you get used to the soft forks and the requisite oversteer, it handles quite well. Don’t get us wrong, it’s nothing to write home about, but it’s acceptable. There is one caveat. If the TM holds true to its Italian heritage, once you stiffen the forks up, that oversteer will quickly turn into understeer. As with most 125 two-strokes, the TM is a rear handler. You don’t dive into the corner with the front wheel as much as blast through the corner by pivoting off of the spinning rear wheel. Q: HOW DOES THE HYDRAULIC CLUTCH WORK? A: First off, we love KTM’s Magura hydraulic clutch. That said, TM’s AJP hydraulic clutch left a lot to be desired. Pulling the TM’s hydraulic clutch felt like stretching a rubber band — a dry, rotted rubber band. We’re sold on the Magura clutch, but the TM’s AJP was bad. The clutch needs stronger springs, a better feel and increased reliability. After only two rides, the clutch was mush. Magura, where are you? (1) Power band: Perhaps the only way the two-stroke can stay alive in a four-stroke world is to become more hyper-kinetic; hit harder, rev quicker and require a lot of tap dancing on the shift lever. However, the TM came on late and didn’t stay on long enough to make the chore pleasurable. 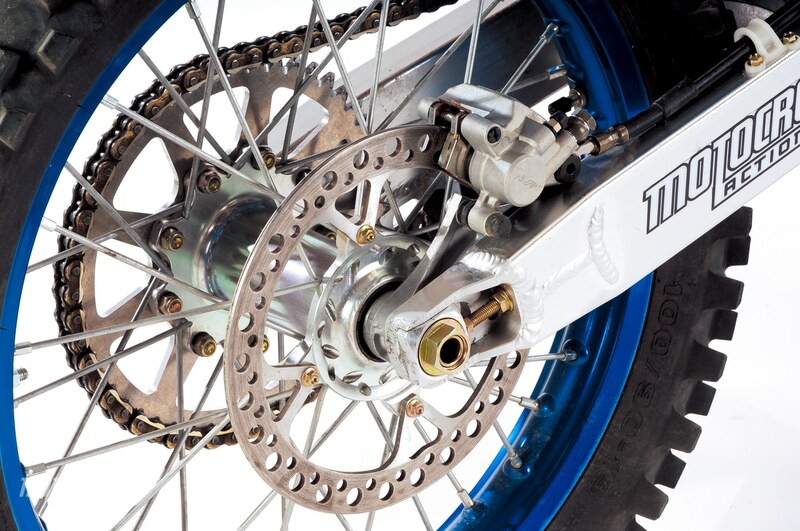 (2) Forks: Apparently, TM’s forks were designed for dirt track racing. (3) Clutch: We never met a hydraulic clutch we didn’t like–until we tried the TM 125MX clutch. (4) Handling: Would you be willing to trade oversteer for understeer? (5) Frame design: TM has a steel perimeter frame. It’s too much. Too much tubing. Too much steel. Too much weight. (1) Accessories: TM claims to manufacture the only “factory” bikes that you can buy. They certainly put a lot of effort into making the 125 look amazing. This is as close to a hand-built motorcycle as you’ll ever find on a showroom floor. CNC-machined parts are everywhere. The hubs are works of art, and the bike bristles with trick parts. (2) Rear brake: At first the rear brake took some getting used to because it was extremely touchy, but after a few laps we wouldn’t want it any other way. 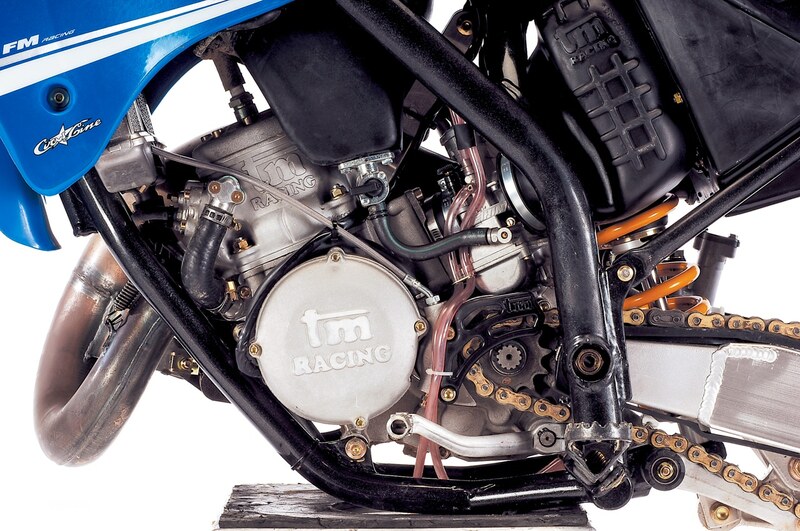 (3) Tires: TM outfitted the 125MX with Pirelli MT32’s, which worked well with the engine’s personality. Good choice for soft terrain–not as good for hard pack. A: If you see a 2006 TM125 tied down in the back of a truck driving down the highway, make sure to honk and wave at us. We have the only one. And unless TM fixes the most basic of its flaws, it will probably stay that way.